Whether it's holiday shopping or searching for a good birthday gift, I'm sympathetic to the shopper who would like to give personal and meaningful gifts but is running up against time. This page offers gemstone jewelry items under $60 USD and the price includes free gift wrapping and shipping. Hooray! 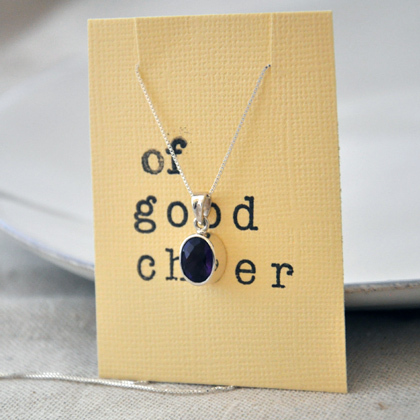 The popular trend of wearing thin, delicate chain paired with small charms or pendants continues, and I've gathered a group of sterling silver and 14kt gold-fill chains with lovely pendants. There's also earrings and a bracelet or two. 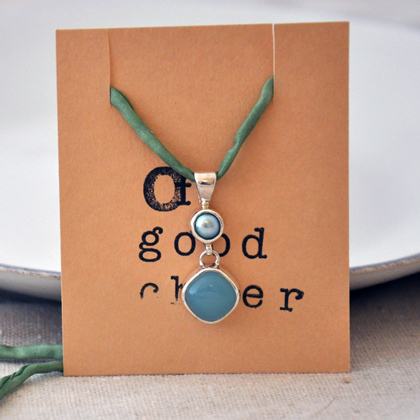 It's possible to get dual use from a necklace with a silk cord or ribbon; it can be tied as a necklace or wound and tied around the wrist as a cool wrap bracelet. Hopefully there's a gift or two that one can use for the next holiday or anyday. 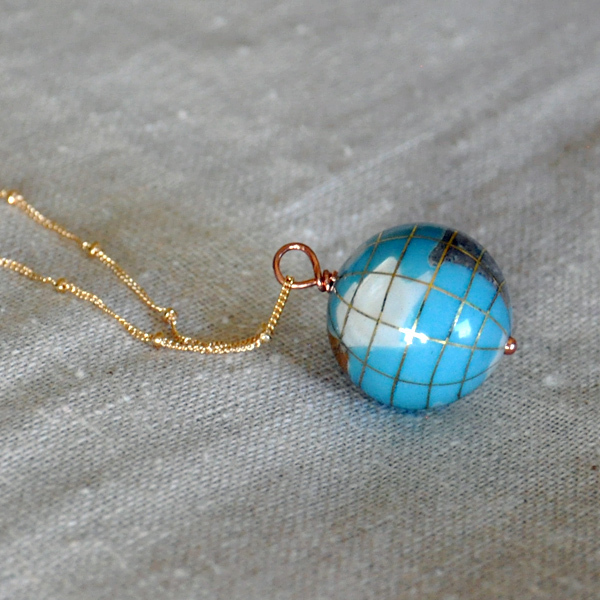 Celebrate Earth Day (on any day) with a 1" replica complete with inlaid gemstones of turquoise, jasper and mother of pearl and gold finish latitude and longitude lines. Pendant is paired with an 18" 14kt gold-fill satellite chain necklace with spring ring clasp. 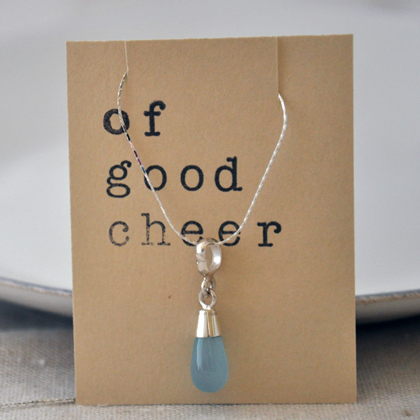 A cool blue chalcedony gemstone teardrop is suspended from a sterling silver setting in this 18" sterling silver link chain necklace. Chalcedony is a microcrystalline variety of quartz that is often dyed bright jewel-like colors (such as this one). Pendant is approximately 1 1/2". 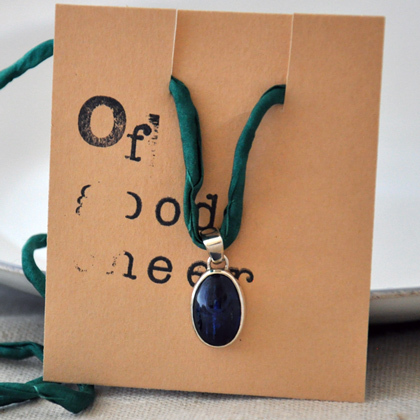 Deep blue kyanite gleams in this 1/2" oblong sterling silver pendant paired with 40" long 2mm silk cord. Kyanite is an alumnosilicate with a different hardness along or perpendicular to its fibers, and it's considered one of most beautiful naturally blue minerals. 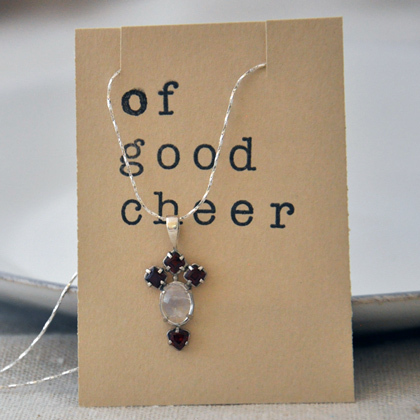 This 3/8" small pendant features a fine example of a faceted pyrope (dark red) garnet gemstone. The sterling silver teardrop pendant is paired with an 18" sterling silver box chain with spring ring clasp. Among the purple gemstones, amethyst is one of the most popular and well known for its outstanding rich color and durability. Amethyst is quartz with color from iron irradiated as the crystal is forming, leading to colors from pale lavender to deep purple. The sterling silver 3/8" oval pendant with faceted gemstone is paired with an 18" sterling silver box chain necklace with spring ring clasp. Peridot is truly out of this world; olivine is a common mineral in meteorites and some even show translucent areas of this yellow-green mineral in cross section. 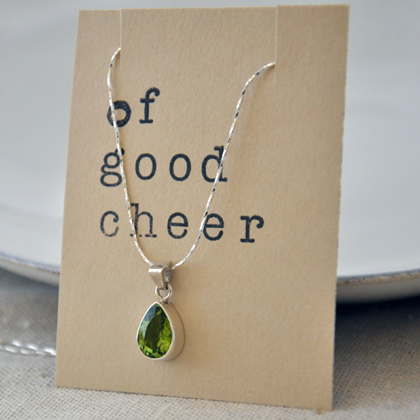 Peridot is the name given to gem quality olivine mineral, and the 3/8" sterling silver teardrop showcases a fine sample of this eye-catching faceted gemstone. It's paired with an 18" sterling silver twist link necklace with spring ring clasp. Two small faceted iolite gemstones set in sterling silver are featured in this 18" necklace of sterling silver Boston link chain with spring ring clasp. Iolite is the name given to gem quality cordierite, an aluminum ring silicate. The pendant is approximately 1". 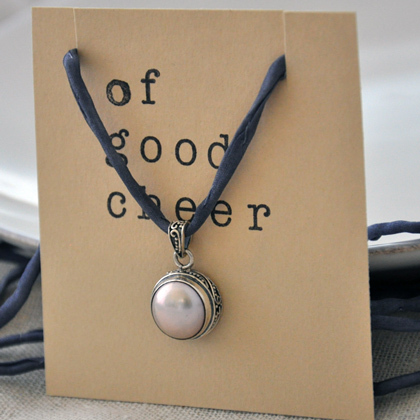 A lustrous mauve freshwater pearl rests within an intricate Bali silver setting in this necklace with a long 42" silk cord. 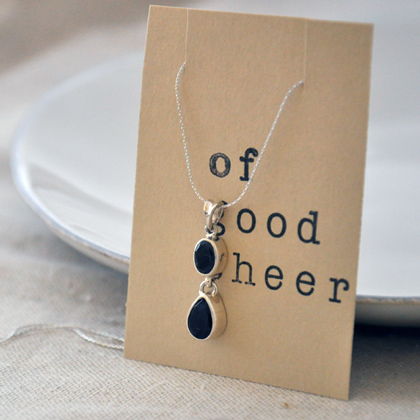 The pendant is approximately 1/2". 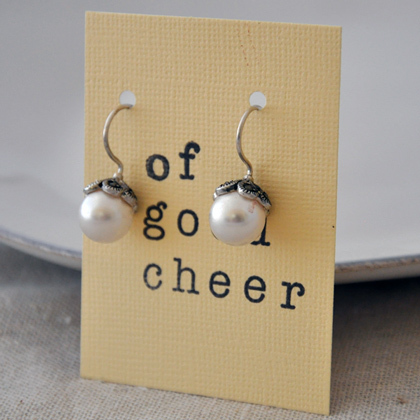 Statement earrings (i.e. 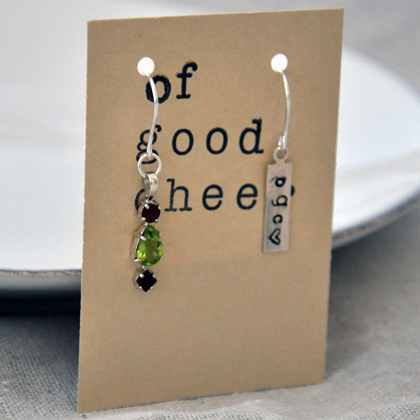 mismatched and interesting) have maintained popularity over the past couple years, and these earrings mixing peridot and garnet gemstones with a sterling silver tag are a fun way to participate in the trend. Length is approximately 1". 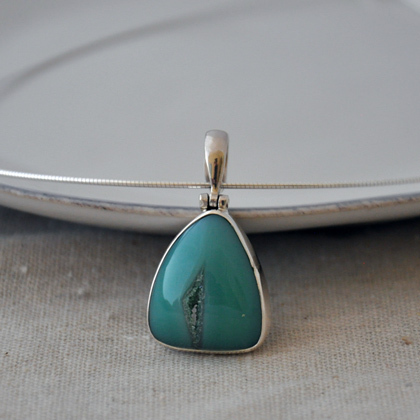 This turquoise dyed druzy quartz gemstone pendant is an ideal size and shape to be an awesome focal element for an outfit. 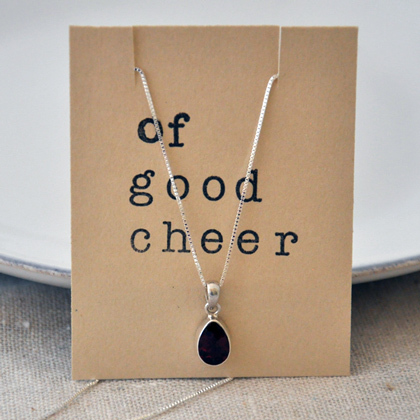 The triangular shaped gemstone is approximately 1" and set in sterling silver, and the pendant is paired with a stiffer 18" sterling silver Omega chain for smooth drape. This 1" pendant glows with soft blue green colors of dyed freshwater pearl and chalcedony set in sterling silver. Chalcedony is a microcrystalline quartz, meaning the crystals tend to be small leading to a translucent rather than transparent appearance. The pendant is paired with a 40" long 2mm silk cord. The tiny faceted gemstones used in the intricate petal design of these 1/2" sterling silver earrings with 10mm half-drilled Swarovski glass pearls are marcasite, which is chemically identical to pyrite though with different crystalline structure. Swarovski is well-known for excellent crystal, and their glass pearls show the same outstanding quality. 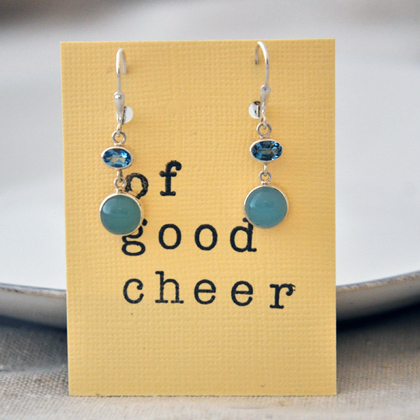 Faceted blue topaz gemstones set in sterling silver top dyed blue chalcedony cabochons in these sterling silver leverback earrings. Topaz can be pale or nearly colorless in appearance, and most blue topaz in jewelry has been irradiated to enhance the blue color. The gemstone drops are approximately 3/4". 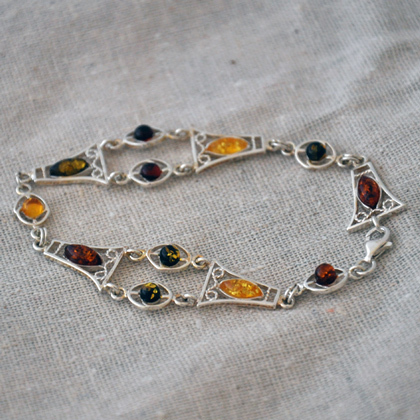 Most amber comes from the Russian Baltic region, and Baltic amber such as in this lovely 7" sterling silver link bracelet shows the range of colors from the region. Sterling silver lobster clasp. A cluster of garnet and rainbow moonstone gemstones are set in sterling silver and paired with an 18" sterling silver twisted link chain for a lovely accent piece. Pendant is approximately 1/2". 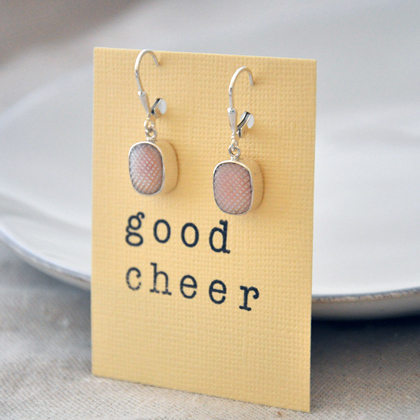 Pink shell cabochons have an etched checkerboard texture in these sterling silver earrings with leverback earwires. Pendant length is approximately 1/2". The sterling silver and 14kt gold-fill chains are 16" or 18" in length with spring ring clasps. As a reminder: sterling silver is 92.5% silver with alloy metals to help resist tarnishing, and 14kt gold-fill is 20% gold per weight, which means a much thicker layer of 14kt gold over the base metal than gold-plating. All the gemstone, shell and pearl pendants are set in sterling silver, and the metal pendants are either sterling silver, bronze (an alloy of copper and tin), 14kt gold-fill, vermeil (22kt gold plating over sterling silver) or lead-free pewter. The gemstones are natural materials - no imitation or man-made items - though some like the red coral may be dyed. The silk ribbons and cords are 100% hand-dyed silk. The leather laces are natural or dyed deerskin leather, a tough but pliable water-resistant leather. Earwires are made from sterling silver or 14kt gold-fill wire. Not finding quite what's needed? Interested in more selections? Try the 20 under 30 page for a variety of charms and pendants and other gift ideas under $30 USD.